Aston Villa midfielder Jack Grealish has signed a new five-year deal with the Championship side. Villa refused to sell the 23-year-old in the summer, with Tottenham strongly linked with Grealish but unable to meet the club's valuation of the player. Grealish will now remain with the Midlands club until 2023. Chief executive Christian Purslow said Grealish "will play a pivotal role in leading" Villa, who are 13th in the table, back to the Premier League. Aston Villa boss Steve Bruce has previously described the Birmingham-born playmaker as "the best young player" he has ever worked with. 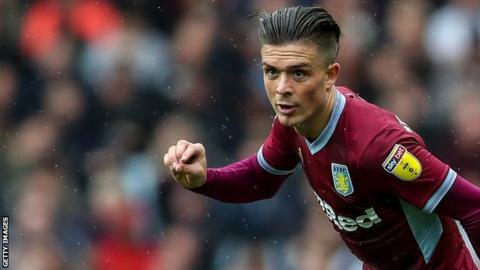 Grealish, who has been with the club since the age of eight, has made 120 senior appearances since making his first-team debut at the end of the 2013-14 season. He scored three goals in 31 games as he helped Bruce's side reach the Championship play-off final last season, where they were beaten by Fulham. Having Grealish commit his long-term future represents a significant coup for a club that had seemingly resigned itself to losing the player. On 10 July Bruce said it was "inevitable" that they would have to sell after they failed to win promotion last season. Villa were under severe financial pressure at the time having missed a £4m tax payment in June while also needing to find £40m to comply with Financial Fair Play regulations. However, on 20 July, investment arrived from billionaire businessmen Wes Edens and Nasser Sawiris, which prompted the club's change in stance on Grealish's future.